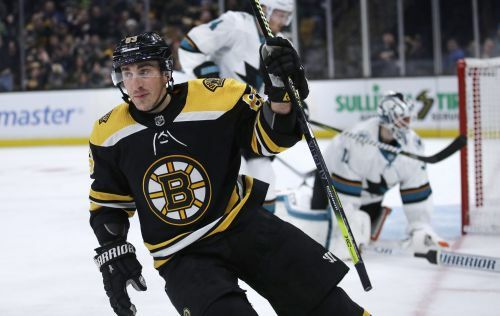 BOSTON (AP) — After an even first period, the Boston Bruins dominated San Jose in the second and outslugged the Sharks in the third. The Bruins continued to surge in the Eastern Conference standings with a 4-1 win over the Sharks on Tuesday night, Boston's eighth victory in nine games and 14th straight with at least one point. "It's nice to get those plays here and there, but it's really just off of playing strong, good hockey," said Brad Marchand, who had a goal and two assists. Charlie McAvoy and Jake DeBrusk scored 37 seconds apart in the second period and David Krejci had a goal in the first for the Bruins, who were back at home for the first time in two weeks. The win set up a showdown Thursday with the NHL-leading Tampa Bay Lightning, who still hold a 17-point lead over the second-place Bruins in the Atlantic Division. The Bruins outscored the Sharks 3-0 in the second and held San Jose to just four shots in the period. "We take a lot of pride in our game, especially the defensive part of it," said captain Zdeno Chara, whose fight with San Jose's Evander Kane early in the third set the tone for the final period. Logan Couture scored for San Jose, and Martin Jones stopped 28 shots. The Sharks, who lost to the Bruins for the second time in eight days, wrapped up a 2-2 Eastern Conference swing. "I thought the first 10 minutes of the second, we started to get some legs and grab some momentum. I liked our game, then within a minute and a half, we're down 3-1 after a couple mistakes," San Jose coach Peter DeBoer said. "But that's what a good team does to you and I think the game ran away from us from there." The Bruins, who had won seven straight before a 2-1 shootout loss at St. Louis on Saturday, broke the game open in the second, scoring three times and just missing on several more opportunities during a flurry late in the period. McAvoy scored 9:09 into the second to put the Bruins up 2-1 on a wrist shot from the slot. DeBrusk scored 37 seconds later after forcing a turnover at the blue line and starting a 3-on-1. Marcus Johansson, traded to Boston from New Jersey on Monday, assisted on DeBrusk's goal in his Bruins debut. "It means a lot, especially this time of year. We can't always rely on the same guys," Chara said. "It's very important that we have other guys stepping up and making plays." Marchand made it 4-1 when he split a pair of defenders in the San Jose zone and got in alone on Jones for a short-handed goal 12:28 into the second. Couture put San Jose up 1-0 on a power-play goal 12:47 into the game. Krejci tied it on a power play less than two minutes later with a one-timer from the left circle. Torey Krug and Marchand assisted. Things got chippy early in the third period, when Kane received a game misconduct after a fight with the 6-foot-9 Chara. The 6-foot-2 Kane took an elbow from the Boston captain and went directly after him for a one-sided bout that left him bleeding from a facial cut. Kane said he was upset when he didn't see a penalty was being called on Chara, then jumped him from behind. "It was a hit right to my face," Kane said. "If I'm going to be officiated in a different way, what am I supposed to do beside defend myself?" Chara was called for elbowing, Kane for instigating and both received 10-minute misconducts and fighting majors. Kane spent 29 seconds in the penalty box before something he said got him tossed from the game 3:51 into the third. Boston's David Backes and San Jose's Michael Haley dropped the gloves five seconds later. NOTES: Marchand has 25 career short-handed goals, tying him with Rick Middleton for the most in Bruins history. ... Boston RW David Pastrnak missed his seventh consecutive game with a thumb injury. ... Gustav Nyquist made his Sharks debut two days after a trade from Detroit. Sharks: Host the Colorado Avalanche on Friday night. Bruins: Host the Tampa Bay Lightning on Thursday night.